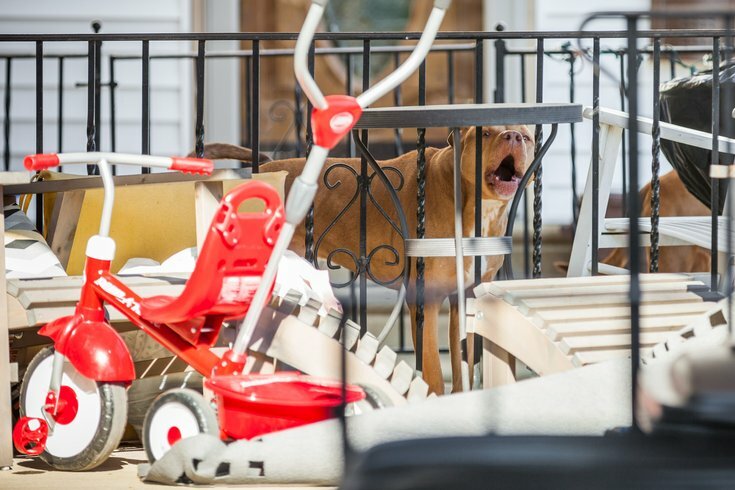 A group of West Mount Airy residents hopes their issues with a pair of troublesome pit bulls are finally over, thanks to a decision issued Wednesday by Judge Joffe C. Pittman III in Philadelphia Municipal Court. Ada Brooks, of the 100 block of West Sedgwick Street, was found guilty of harboring a pair of dangerous dogs, a verdict that will require Brooks to take greater safety precautions or surrender the animals. Neighbors allege the dogs have bitten at least three people and four dogs during the last three years. They testified to three of those incidents Wednesday, telling Pittman that they fear the next incident could involve a child. Their concerns did not fall on deaf ears. "I think this is a serious, serious issue and I'm not going to take it lightly," Pittman told Brooks as he announced his verdict. "This is a problem that needs to be taken care of before someone else gets injured." Pittman ordered Brooks to register her dogs, Zion and Micah, on the state's dangerous dog registry, a public listing that details the addresses of dogs that have been declared legally dangerous. Brooks also must take out insurance policies on the animals, keep them muzzled when off her property and ensure they are properly confined within her home. Additionally, Pittman sentenced Brooks to pay a $500 fine and restitution to two of the victims. Three victims – Pashi Mida, Barbara Patrizzi and Michelle Nashleanas – each testified that the pit bulls bit either them and/or their dog. They also testified that the pit bulls have been observed off leash and without muzzles on numerous occasions. "I was satisfied with the ruling," said Patrizzi, who testified that the dogs bit both her and her dog in March 2015. "My only concern is that Ada has shown irresponsibility thus far. My fear is that she will continue to show that same irresponsibility and that something more could happen. We're hoping for the best." Are Philadelphia's dangerous dog citations still lagging? Brooks declined to comment on the outcome of the hearing. The ruling came after repeated efforts by the neighbors to seek intervention from both police and animal control. They finally made headway after the latest incident, in February, when Mida was bitten after stepping outside her back door. "Immediately, the (unleashed) dogs rushed me," Mida testified. "I wasn't sure what was going to happen, so I just stood still." Zion bit Mida first in the upper thigh before Micah nipped the back of her calf, Mida said. Nashleanas, a physician, treated her wounds. The attack mobilized the neighborhood. At a community meeting, Philadelphia police agreed to cite Brooks for the latest incident. But the "dangerous dog" distinction has not been applied to Philadelphia dogs nearly as frequently as it has elsewhere in Pennsylvania. The state's dangerous dog registry, maintained by the Pennsylvania Bureau of Dog Law Enforcement, lists 12 dangerous dogs in Philadelphia. That number is far below the 162 listed in Allegheny County, which includes Pittsburgh. Yet, a little more than one year ago, no Philadelphia dogs were listed until an inquiry by PhillyVoice. At the time, information was not being sufficiently reported to the state and there appeared to be confusion among the agencies responsible for enforcing dangerous dog laws. The Bureau of Dog Law Enforcement subsequently mailed letters to city police and the Philadelphia District Attorney's Office reiterating their roles in reporting dangerous dog cases. Police issue citations then taken by prosecutors before a judge, who can decide whether a dog should be declared dangerous. If it is, animal control is responsible for ensuring that dangerous dog owners meet various stipulations. The verdict issued by Pittman exemplified how the process is supposed to work. "I'm so grateful," Nashleanas said. "I appreciate the efforts of Assistant District Attorney Barbara Paul on advocating on our behalf. We will assist her, as necessary, with reporting (any) lack of enforcement." Brooks testified that only the incident involving Patrizzi occurred under her care. The others came under the watch of her son, who no longer lives on the property, Brooks said. She only learned of them days afterward from neighbors. Brooks said she offered to pay Patrizzi's medical and veterinary bills, but has been unable to do so. "I'm very, very sorry about all this that has happened," Brooks testified. "Everybody is on pins and needles. It shouldn't be like that. ... In order to heal, you need to be able to forgive." Brooks testified that she never takes the dogs out of the house without a leash and that she has begun walking them at Valley Green at hours when other dogs are unlikely to be present. She said her porch has a wrought iron fence that properly confines the animals on her fence, though residents insisted the dogs can jump over it. "Most of the time, I'm out there sitting with the dogs," Brooks testified. "If I'm not, they're only out there for a short time." But her neighbors painted a different story, testifying that residents feared taking their dogs into shared community space. Nashleanas said she considered moving out of the neighborhood. Now, they move forward hoping Pittman's verdict will prevent any further attacks and assuage their fears.